On this page is a picture of our Radio Read Meters. As you can see, it still has the numbered dial so you can check it as you always have. The biggest difference is the yellow antenna. This stores the meters activities and transmits the reading to the vehicle as we drive by. 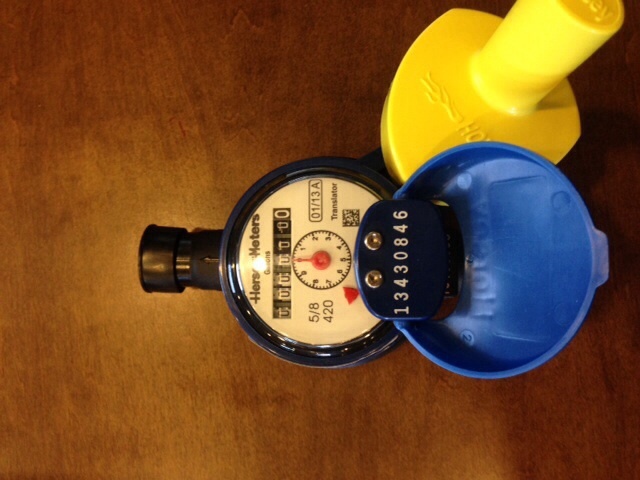 This meter will store water consumption every hour for 170 days. We can tell when and how much water has went through the meter, but we can't tell where the water went. We will provide as much assistance as we can to help you find your leak. The red triangle on the face of the dial is the leak indicator. If that triangle is moving, water is going through the meter. If everything in your house is off, and the triangle moves, you have a leak somewhere.